Home Design Is SuperAdobe in your future? I’m often met with blank faces after mentioning SuperAdobe in general conversation. 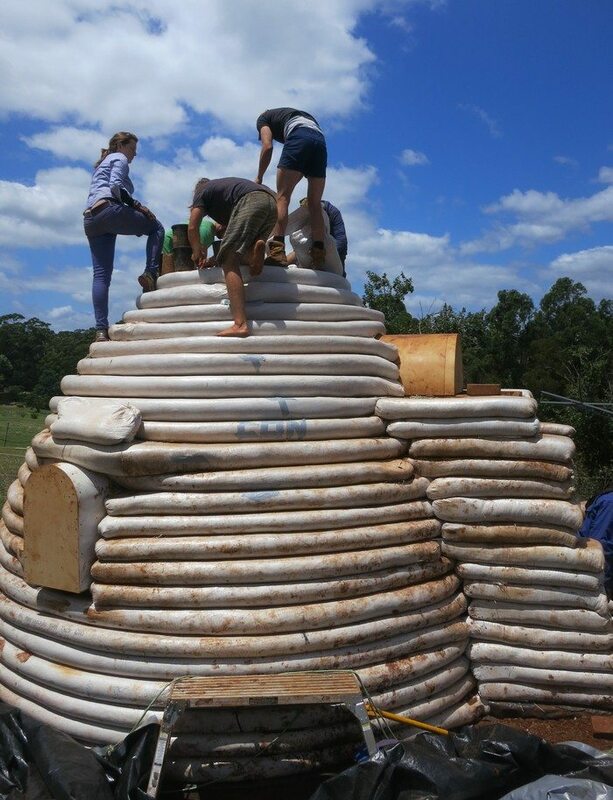 Even introducing the term ‘Earthbag Building’ doesn’t help to alleviate the issue. 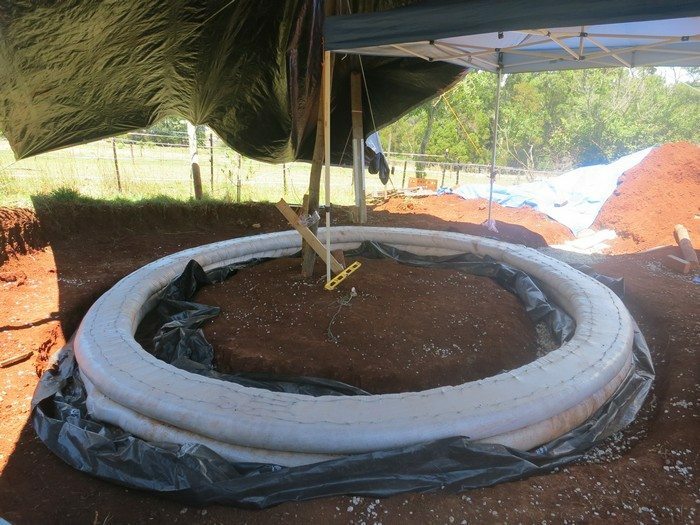 It saddens me to know that such a beautiful, successful, cheap, easy to master Natural Building method hasn’t yet taken a stronghold here in Australia. 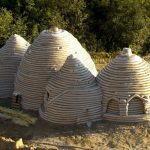 I hope to help change that over the coming decade, to hopefully introduce SuperAdobe and Earthbag building into the common vernacular. 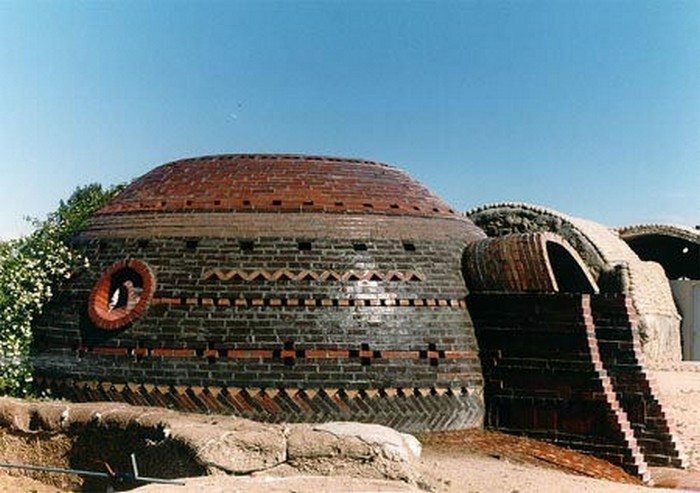 SuperAdobe is a term coined by Iranian architect Nadir Khalili. After a fruitful life as a commercial architect in the US he traded it all in for a chance to discover something simpler. 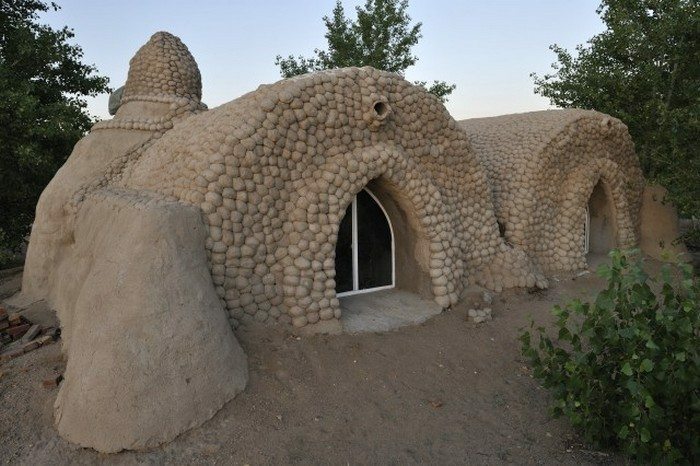 He began experimenting with the earth below his feet on a property in the Californian High Desert. 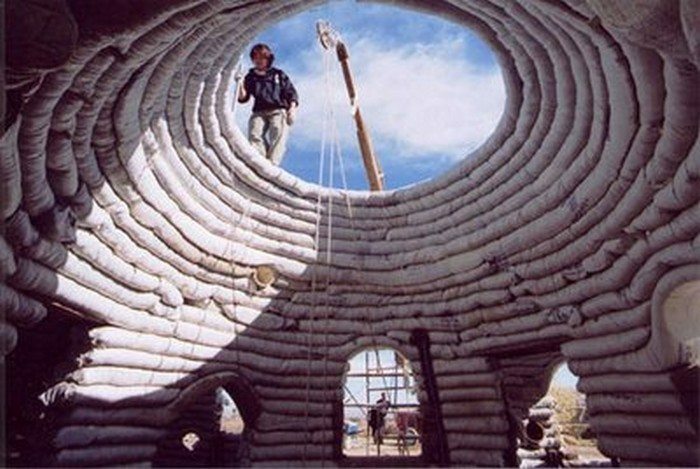 With the help of his architecture students and volunteers, he began to build odd structures amongst the Joshua trees. 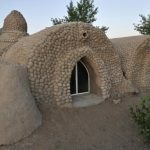 From his travels throughout Iran he had noticed a flaw in all of the traditional Adobe buildings of the native people; their inability to withstand earthquakes and heavy rains. He concluded that there was an element missing from these structures, and endeavoured to discover what that was, so that he could offer a cheap, strong alternative for people seeking shelter all over the world. The system he invented was incredibly simple, built from the earth, at an incredibly low price. 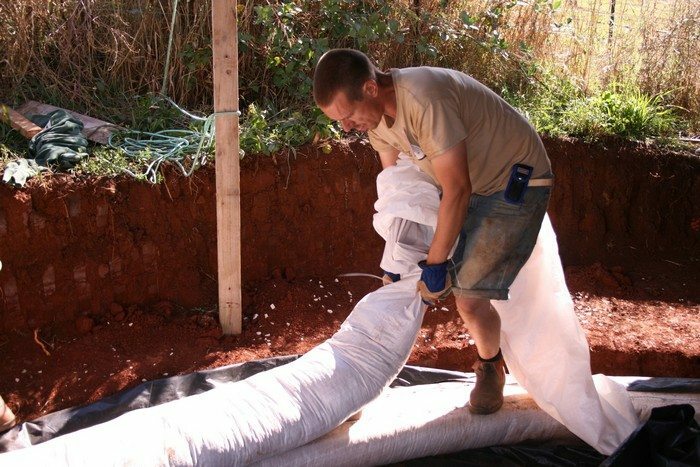 His system employs long, uncut polypropylene bags, traditionally used for grain storage. 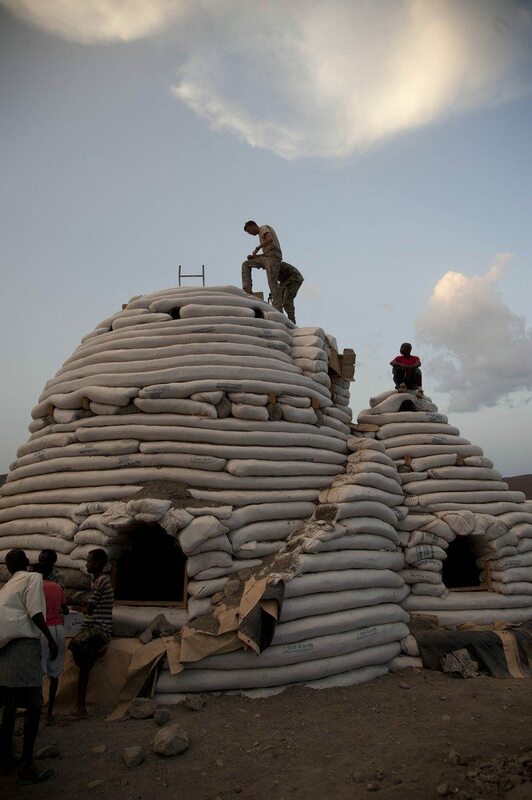 These rolls are filled with soil taken from the build site, often stabilised with a small amount of cement or lime, wetted, and filled from coffee cans. Each row is kept circular by using 2 compasses. One central to maintain the rings circular layout, and the second to tell how far inward the rows must come to achieve the dome shape as it builds upwards. A SuperAdobe workshop participant learning how to use the compass system. Barbed wire is then laid in between each row of bag for tensile strength and to hold the bags onto one another. The circumference of the rings are then systematically lessened to bring the walls into the center, achieving the Dome form. Each rows circumference is then systematically lessened to bring the rings inward toward the center of the dome, based off a compass made from chain. 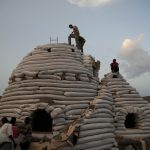 This is the key to these buildings’ simplicity and strength, and the ability for anyone to be taught the construction technique in easily and quickly. Once the desired height is achieved, the dome is gradually closed. From this stage, plastering and rendering can begin. An art and process unto itself, this can be achieved in any way the owners wish. 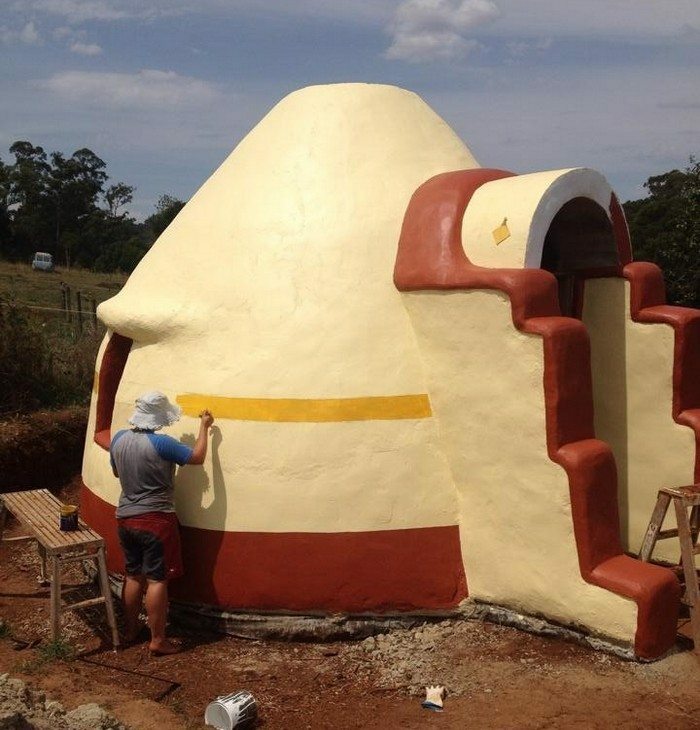 Following in the Natural vein, a cob plaster with a lime finish can be used to achieve a beautiful breathable building, both inside and out. If located in a higher rainfall or humidity area, a more substantial waterproofing can be undertaken, with modern paints or sealants. These buildings are tested against the stringent building codes of California, one of the highest residential earthquake zones in America, and have proved so successful that they had to stop the testing due to the risk of damaging the earthquake machines! An orphanage close to Kathmandu withstood the recent 7.2 earthquakes with only minor damage to the plaster work! 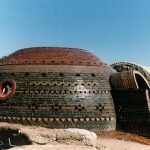 The strength of these buildings is thanks to their circular, dome shape. The Dome is in fact an arch, spun on it’s axis 360 degrees. Given the arch is one of the strongest forms in architecture, these buildings are also some of the strongest you can build. 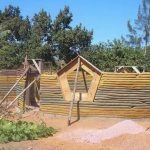 Coupled with the huge mass of the walls, they make for a practically indestructible home, safe from hurricane, tornado, earthquake, flood, almost anything! 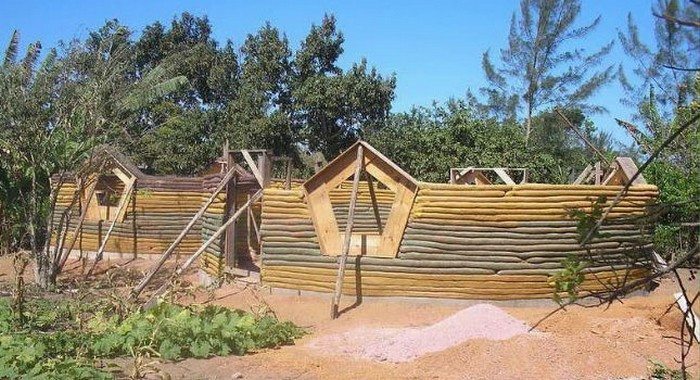 The buildings use soil dug from onsite to fill the walls, accounting for around 90% of the materials used (if the soil is adequate based off simple soil tests completed by the owners). This allows the possibility to cut material costs down considerably and to use renewable, safe materials. 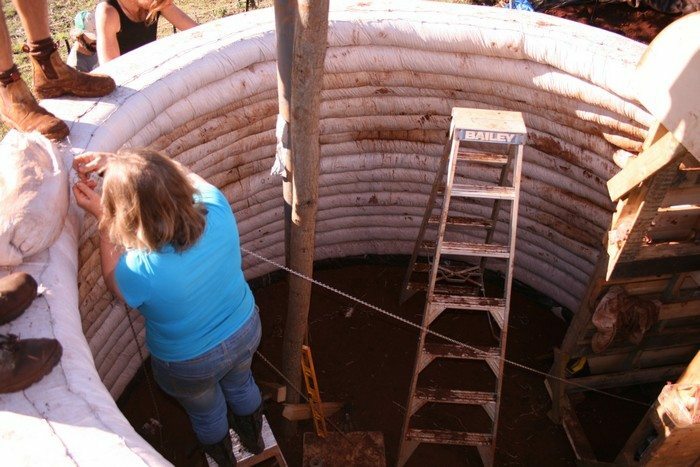 The main costs to the owner are the bags, the barbed wire, and plastering costs. These buildings have been approved in Australia for residential construction in a flagship build headed by Jeremy Millington of 1:1 construction out of Adelaide SA. This build has paved the way for SuperAdobe to enter into the mainstream mindset of Australian builders and owners alike. 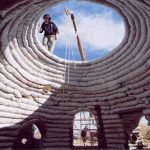 Currently, this technology is taught and shared through a few small groups running natural building workshops; a meeting of keen students who come to construct a building from SuperAdobe to learn all about how they can apply it to their lives and projects. The workshops are great weeks of skill-sharing and promotion of all things off-grid, healthy, and happy. Come and join in! Hayden runs Curvatecture, a small business dedicated to sharing SuperAdobe skills in Australia and around the world. 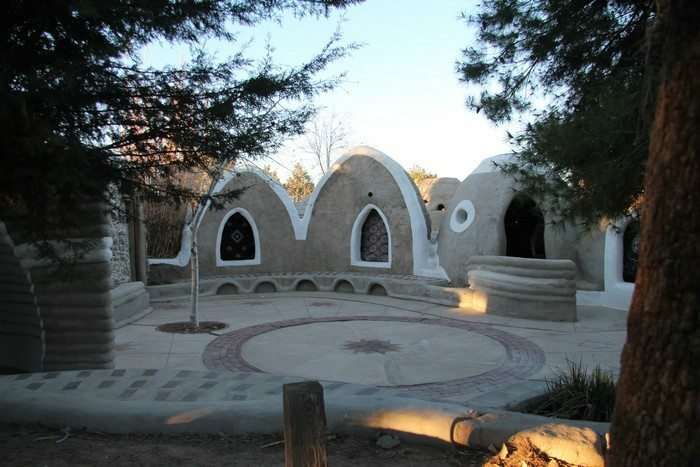 After studying at SuperAdobe’s birthplace, Cal-Earth, he returned home and began hosting local workshops for everyday Australians on how to take construction of your own home and spaces into your own hands, while also spreading communal living and natural life-style principles along the way. 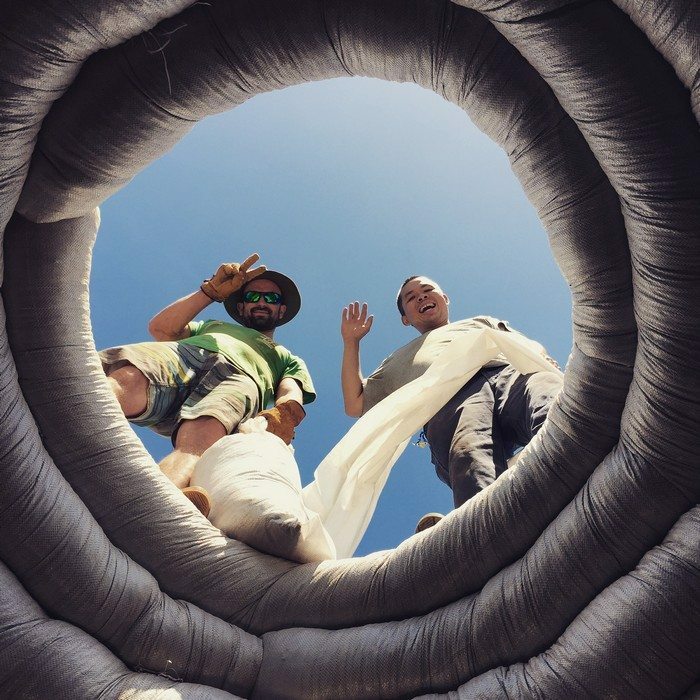 Curvatecture’s workshops are a time of wonderful energy, personal education and growth, welcoming people of all ages and cultures to share their knowledge and skills. We work alongside professional tradesmen to adequately give an all encompassing skill-set for any owner-builder, or backyard hobbyist, packed into a short 1-2 week workshop. Previous articleAre antibacterial soaps hurting your family? 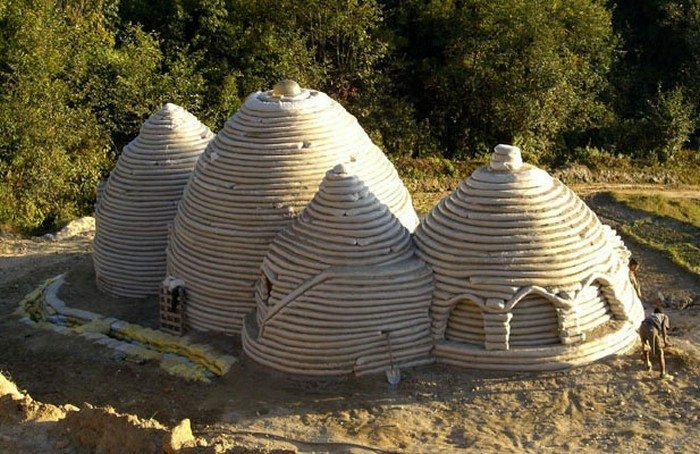 It sure does like an alternative to conventional building but do you think it’s worth the effort? I know that companies like Ikea have ready to assemble houses on the market for quite a while. With the methods from above you could not really build higher roofing or wider spaces or could you? My emotions are really contradictional.